As it happens, my wife and I do bank with the ANZ. 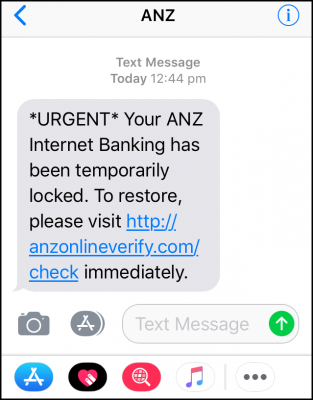 However, the ANZ Bank is huge in Australia, so if enough of these types of text messages are sent out at random, the chances of them hitting a large number of ANZ customers is very good. Of course, I didn’t click on the link but rather immediately rang the ANZ Bank to verify the status of my account and report this phishing attempt. And remember– if it sounds too good to be true, it usually is! I must be considered an easy mark because I regularly receive phone calls from these lovely people with a distinctly offshore accent claiming to be Microsoft representatives. The way I deal with them now is, as soon as they’ve introduced themselves, I say… “No you’re not, don’t be so silly“, and that is usually followed by a loud click from the other end as they quickly hang up. How rude! What these people will tell you is that your computer is transmitting Trojans, or some other similar nonsense, but they can fix it for you in a twinkle. Their end goal is to gain remote access to your computer in the hopes of maybe extracting critical information, such as passwords, banking or credit card details. Remember– institutions such as Microsoft will never contact you via an unsolicited phone call. It’s a dangerous cyber-world out there folks, tread warily and carefully! This surely hits home!!! Been getting emails from amazon.com saying my order is ready to ship, only trouble is I haven’t ordered anything. Got a phone call the other day from a guy saying my PC needed fixing and wanted access to my PC. We live in a very different world since the internet age. Good day Jim. Seems the best way to help avoid phishing scams is by not supplying your email address to these services. This should also work for mobiles and land lines, as they must provide you with a valid call back number which you can verify. The panic they provide is what generates their business. They rely on the a certain percentage of people who just click, click, click …. without taking a breath and thinking. I can remember my first banking email scam. It was from an American bank informing me my account was compromised. I was amused a bank I had no dealing with sending me information. So I supplied bogus information to that link, and informed the security section of that bank of the fraud. Today, should I be silly enough to click onto a phishing scam link, my protection software automatically warns me and blocks my attempt. Progress indeed. My two cents when faced with panic message is to breath first, think, and refrain from clicking. Contact the institution via secure means to obtain information if there was indeed a threat, Mindblower! 1. Inform them I don’t have a computer which throws them off script for some reason. 2. Play along with their instructions without actually doing anything. This can be amusing at times while they try to figure out what’s wrong. Especially when they ask leading questions. 3. Just say “No, you’re not.” and hang up.